HE HAS been scarred by sharp coral, pricked by a sea urchin, and twice he had close brushes with death when he ran out of air under water. Yet, his passion for the sea and the urge to protect all creatures in it - dangerous or not - could not be easily doused. When he retires at the end of the month, National University of Singapore (NUS) marine biologist Chou Loke Ming, 67, can look back on three decades of effort to advance marine conservation. 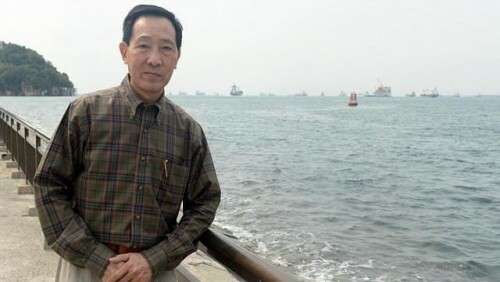 Along with other active marine conservationists, such as lawyer Francis Lee, 68, Professor Chou had led calls for the establishment of a marine park. A 40ha patch that includes the Sisters' Islands and reefs off nearby St John's Island and Pulau Tekukor was finally set up earlier this year. In 1987, Prof Chou and Mr Lee also started the Singapore Reef Conservation Committee, training 200 ecology specialist divers to survey the southern reefs, which were affected by extensive land reclamation works. But even as he prepares to drop the sails on teaching, Prof Chou has packed his post-retirement schedule with more plans to contribute to marine biology. Just last week, he jetted off to Bali, Indonesia, to prepare for two books on coastal management that he plans to co-write when he retires. He will also take on an adjunct role at the Tropical Marine Science Institute - spending eight hours each week managing a reef restoration project. Prof Chou also hopes to nurture a similar love for the ocean in his grandsons, aged two and three, by taking them to the aquarium and on snorkelling trips. "I just hope to expose them to (the sea), not indoctrinate them, they will still be free to pursue their own dreams," said the soft-spoken professor, who is the principal investigator at NUS' Reef Ecology Lab. His love for the sea, Prof Chou said, is anchored in his childhood. As a child growing up in a fishing village in Siglap with a younger sister, he spent his days swimming frequently in the sea and mixing with fishermen. As a pre-university student at Victoria School, he went on field trips to the Southern Islands. Back then, the waters were much clearer, said Prof Chou, and a far cry from the heavily sedimented waters that surround Singapore today. "It was easy to see the whole reef, up to 10m under, from the surface," said Prof Chou. He later went on to research house lizards for his doctorate in zoology at NUS, where he met his wife, Renee, and picked up the electric guitar. He and his wife, a retired aquaculture officer at the Agri-Food and Veterinary Authority, have a daughter in her late 30s. In 1977, he fulfilled his aspiration of becoming a university lecturer. "At that time, the only opening at the university was for the role of a vertebrae zoologist, and house lizards were one of the easiest vertebrates to study," he said. But Prof Chou could not resist the call of the ocean. Three years later, in 1980, he switched his field of study back to the marine realm and started to do research on nudibranchs - the colourful slugs of the sea. In 1986, his laboratory - originally a hub for studying reptiles - was renamed the Reef Ecology Laboratory, with research in areas such as coral reef biology, reef restoration and intertidal ecology. Prof Chou's former student, Dr Neo Mei Lin, 28, said: "He has always been a father figure in the lab, and his charisma draws many students like myself to join marine biology. "I will always remember his words of wisdom on marine conservation in Singapore... It's not about how much change we make, but how that small difference can lead to something bigger." But the Reef Ecology Lab will be phased out when Prof Chou leaves the department at the end of the month. He said he "will be glad if a suitable candidate decides to revive it". On retirement, he said: "In a way, I am relieved that I no longer have to do mundane admin work. "But I am also prepared for retirement... I will be involved in many projects in the region," he added. "For me, marine biology is a form of relaxation."